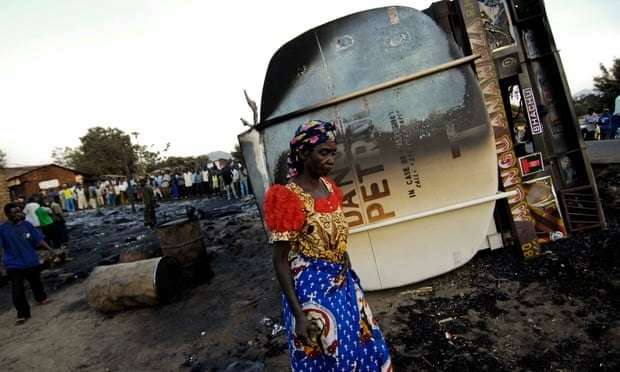 Officials in the Democratic Republic of the Congo say at least 50 people are dead and more than 100 have second-degree burns after a tanker truck caught fire. The accident occurred on Saturday in the village of Mbuba, not far from Kisantu city and about 124 miles (200km) south-west of the capital, Kinshasa. Witnesses say the tanker truck collided with a bus and when the fuel began to leak, villagers rushed to collect it. Then the fire broke out. “We deplore the deaths,” the interim governor of Kongo-Central province, Atu Matubuana, said. Officials were preparing to identify the bodies and bury them, Matubuana said. Health officials had been instructed to prepare local hospitals to “do everything necessary” to treat all of the victims, the interim governor said. In 2010, more than 200 people were killed when a tanker truck overturned and caught fire in the DRC’s South Kivu province. Many of the victims had been trying to collect the leaking fuel when the fire took hold.